Keisuke Fukuchi of Japan took home the trophy at the World Othello Championship held in Prague, Czech Republic. At 11 years of age, he’s the youngest champion ever in the tournament’s 42 year history. On his flight home via All Nippon Airways, a congratulations was announced by the pilot, Kunihiko Tanida, the previous record holder for youngest Othello champion (which he had held since 1982). The World Chess Hall of Fame in St. Louis reclaimed the record for the world’s largest Chess piece. It previously held the record with a 14 foot tall king from 2012 to 2014 but was then eclipsed by a school in the town of Kalmthout, Belgium. The new record-making piece is a 20 foot tall black Staunton king with a base of 9 feet 2 inches and a weight of 10,860 pounds. It was hand carved from African Sapele Mahogany. 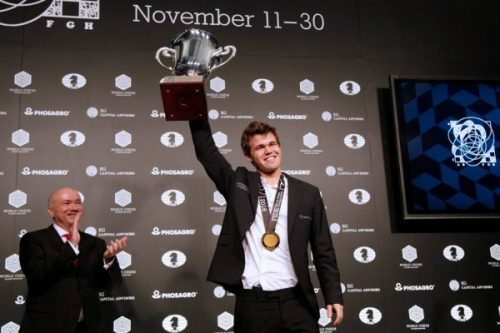 Magnus Carlsen of Norway successfully defended his World Chess Champion title against Fabiano Caruana of the United States by intentionally playing for a draw in standard time controls and then winning three straight in rapid tie-breaks. At the World Rapid Chess Championship, though, Carlsen tied with three others for second place. The winner in that event was Daniil Dubov of Russia. Following that was the World Blitz Chess Championship, where Carlsen again came out on top. With a win at the London Chess Classic, Hikaru Nakamura of the United States secured first place in the multi-tournament Grand Chess Tour series. Among artificial entities, Chess engine Stockfish won both Rapid and Blitz categories of the Chess.com Computer Chess Championship. Houdini came in second in Rapid, where the final match took place over 200 games, and Komodo came in second in Blitz, where the final was 300 games. Nigel Richards won his fourth World Scrabble Championship with a final game score of 575-452, that achieved with such words as “groutier” (68 points), “zonular” (100 points), and “phenolic” (84 points). His opponent managed “maledict” for 95 points. A new edition of The Official Scrabble Players Dictionary makes legal play out of “sheeple”, “ew”, “OK”, “yowza”, and “zomboid”. It also adds another q-without-a-u word, “qapik”, a monetary unit from Azerbaijan. Javier Dominguez of Spain, who last year finished in second place, managed a win in this year’s finals, taking home $100,000 and the trophy for Magic: The Gathering World Champion. Akiko Yazawa of Japan, cancer survivor, won her second World Backgammon Championship title. Topping a field of 76 contestants from 46 countries, Quetzal Hernandez of Mexico won the Catan World Championship in Cologne, Germany. Elena Short of Ukraine finished first in both the women’s classic and women’s blitz sections of the World Championship in Draughts 64. Wu Yiming, 11 years old, of China became the country’s youngest female professional Go player. In late December 2017, thirteen year-old Que Jianyu appeared on Chinese television and solved three Rubik’s Cubes while continuously juggling them, and did so in a world record 5 minutes 6.61 seconds. Then in December of this year, he went on Italian television and broke his own record by just over 4 seconds. Between these two events, he also broke speed records for solving three Rubik’s Cubes simultaneously with hands and feet (1 minutes 36.39 seconds) and solving a single Rubik’s cube while hanging upside down (15.84 seconds). At the Cube for Cambodia event in Melbourne, Australia, Feliks Zemdegs solved a 3×3 Rubik’s Cube in a world record 4.22 seconds. 4×4 in 18.42 seconds and 5×5 in 37.28 seconds at SacCubing in Roseville, California. 6×6 in 1 minute 13.82 seconds at WCA Asian Championship in New Taipei City, Taiwan. 7×7 in 1 minute 47.89 seconds at West Coast Cubing Tour in Fresno, California. 16.55 seconds for 3×3 blindfolded, set by Max Hilliard at the Puget Sound NxNxN in Tacoma, Washington. 1 minute 26.41 seconds for 4×4 blindfolded set by Kaijun Lin at the Please Be Quiet Beijing in Beijing, China. 3 minutes 1.01 seconds for 5×5 blindfolded set by Stanley Chapel‎ at the Shaker Fall in Shaker Heights, Ohio. Grégoire Pfennig of Belfort, France built the largest order working Rubik’s Cube puzzle, 33×33. Imagine how long it would take to solve that! A group of four in Moscow set a world record for the number of escape rooms attended in 1 day, 22. At the World Rummikub Championship in Jerusalem, Kohei Numajiri of Japan came in first place, Sasha Erlich of Israel came in second, and Matthijs Delvers of Netherlands third. Ankush Khandelwal of the U.K. won the Pentamind World Championship, a tournament that consists of matches in Quoridor, 7 Wonders, Acquire, Liar’s Dice, and Chess 960. Brain Games held its first ICECOOL World Championship event at BaltiCon in Riga, Latvia, where Khanh Hung Dong of Canada took home the trophy and a prize of a weekend for two at Snow Village in Lapland. Magnus Carlsen has emerged victorious over challenger Fabiano Caruana at the 2018 World Chess Championship in London. While spectators and fans may have been disappointed by the early draw in game 12, Carlsen’s strategy proved successful. He won three straight in the tie-break rapid games and will go home with a €550,000 prize. 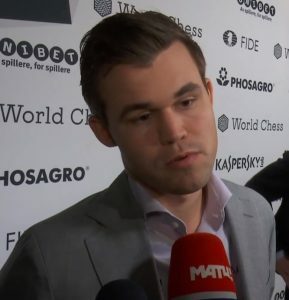 Answering questions after the match, Carlsen said that Caruana was his toughest challenger yet for the championship. One of several world-record domino felling attempts over the weekend in Nidda, Germany was ruined by a fly. Other records, including ones for largest wall and largest spiral, were achieved. However, a setup of mini-dominoes fell prematurely when a fly landed on one of the pieces. Not enough time was available before the scheduled event to reset the mini-dominoes, a process that requires the use of tweezers. Open source Chess engine Stockfish won Chess.com’s Computer Chess Championship, clearly leading the 10-engine, 90-game round-robin and then edging out runner-up Houdini in a superfinal that included 20 rapid, blitz, and bullet games. Stockfish, though, may be on the way out as grand computer Chess champion. AlphaZero, an algorithm developed by Google’s DeepMind subsidiary, with nothing more than the basic rules to get started, taught itself Chess well enough in 4 hours to beat Stockfish handily over a 100 game series with 28 wins, 72 draws, and zero losses. Though some questions remain about the conditions of the contest, AlphaZero’s play was amazing not only for its performance but also for its style. 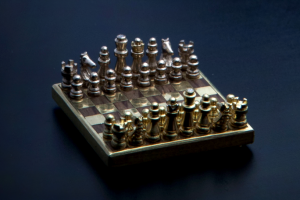 Artist Ara Ghazaryan of Los Angeles has assembled the world’s smallest handmade Chess set with a board measuring 15.3 x 15.3 mm and a king piece standing 4.8 mm tall. Ghazaryan used Brazilian cherry wood, 18 kt. yellow and white gold, and diamonds in building the set. The current general World Chess Champion, Magnus Carlsen, won the World Blitz Chess Championship. The previous World Champion, Viswanathan Anand, however, demonstrated that he still retains the competitive spirit, taking home the trophy of the World Rapid Chess Championship. Kacper Piorun of Poland won the World Chess Solving Championship for the fourth year in a row. The Solving Championship presents competitors with a variety of Chess-game puzzles, such as how to guarantee White a mate in a limited number of moves. There are also helpmate challenges, which require figuring both Black and White-side moves to arrive at mate in a set number of turns, and selfmate challenges, a kind-of suicide puzzle, where the goal is to move White such that it forces Black to mate. At a Rubik’s Cube event in Chicago, Seung Beom Cho solved the 3×3 puzzle in a world-record 4.59 seconds. At an event in Plano, Texas, Max Hilliard did it blindfolded in 17.87 seconds (also a world record). Carter Pfeifer Mattig of Chicago won the Merit Open International Backgammon Championship in North Cyprus, taking home a prize of €77,600. 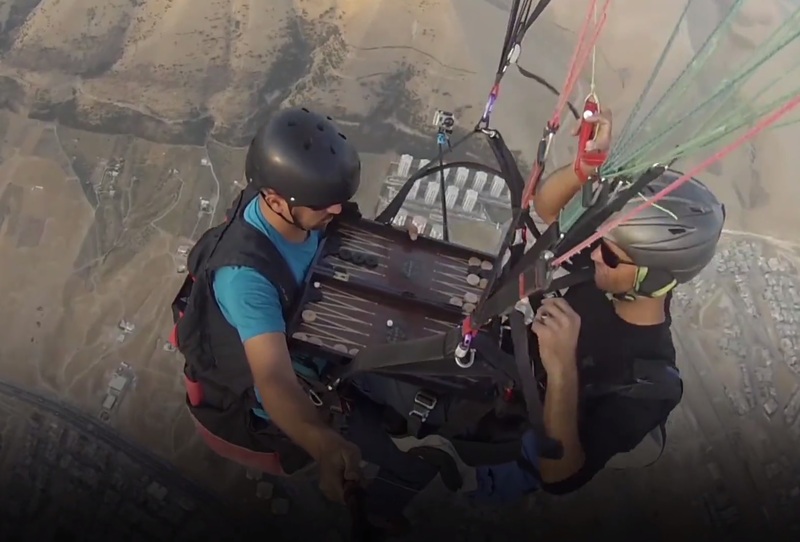 In Sulaymaniyah, in Iraqi Kurdistan, two brothers played Backgammon several thousand feet in the sky, while paragliding. Eight year-old Zack Barnett, the youngest player ever to do so, won the title of Top Trumps Champion. There was a Klask World Championship (the first) in Copenhagen. The winner was Kevin Reder of Michigan. A Pandemic Survival World Championship was held in Amsterdam, where the team of Sébastien Roy and Sébastien MacKenzie Faucher from Canada were declared the winners. Pandemic Survival is a scenario-based version of the game and the tournament rules limit player turns to one minute. David Eldar of London claimed the top trophy and a £7,000 prize at the World Scrabble Championship in Nottingham, U.K., finishing 3-0 in the best-of-five final series. His last play was the word “carrels”. Marty Gabriel of Charleston and Scott Garner of Memphis received recognition from Guinness World Records for the highest Scrabble score in 24 hours (two players). Over the course of 240 games (averaging just under 6 minutes per game), the pair scored a total of 216,439 points. As soon as each game was finished, assistants removed the just-played board for documentation and provided the pair a new board already set up for play. A team in Michigan toppled 245,732 dominoes in a setup that paid homage to various board games. The project also broke the U.S. domino records: largest domino field, largest domino structure, and largest overall domino project. In Germany, Sinners Domino Entertainment broke the world record for most dominoes toppled underwater, 11,466. Taking home the trophy and a $10,000 prize at the North American School Scrabble Championship was the team of eighth-grader Jem Burch and seventh-grader Zach Ansell, both of Los Angeles. Their final round score was 374-349 on such words as eugenia, infares, entresol, and steeping. At the Xi’an Cherry Blossom tournament in China, Kaijun Lin solved a 5×5 Rubik’s Cube in a world record 4 minutes, 11.93 seconds. Then 2 weeks later, he broke his own record, solving the 5×5 in 4 minutes, 10.00 seconds. Fourth-dan Sota Fujii, the youngest ever professional Shogi player, has extended his winning streak to 16 matches. The final round of the Women’s World Chess Championship saw Anna Muzychuk (Ukraine, GM, 2558) and Tan Zhongyi (China, WGM, 2502) tied 2-2 after four games of classic time controls, and still even after the first rapid tie-break game. Zhongyi, though, won the second and the World Champion title. Wesley So, now the world’s number 2 ranked Chess player, came in first at the U.S. National Championship but only after facing down Alex Onischuk 1½-½ in a rapid playoff round. In the women’s section, sixth seed Sabina-Francesca Foisor was the winner with an 8-3 score, one point ahead of the 2016 champion. The German Bundesliga professional Chess league has finished its season with the Baden-Baden team reclaiming the title it had lost last year after 10 previous consecutive wins. In the 4NCL English professional league, team Guilford won for the fifth year in a row. Keegan “Kelian-05” Tailleur was the winner of the 9th Memoir ’44 French Open, a 2 day tournament with special scenarios based on tanks. A new world record has been set for most dominoes toppled in a single line: 15,524. 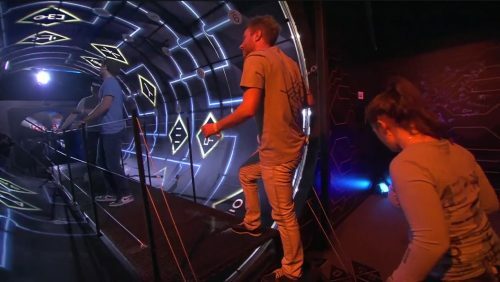 A team from Slovenia won the Red Bull Mind Gamers’ first Escape Room World Championship, which featured some really high-end set design (including a rotating tunnel) and challenges themed around quantum computing. The escape-rooms were designed by Prof. Scott Nicholson and his students at Wilfrid Laurier University. Held this past week in Budapest, the event ran more than 20 international teams through a series of timed challenges, with the top two teams, Slovenia and Ukraine, moving to the finals. There, the teams’ performance on a series of additional challenges—including one that surprised the competitors by needing to be solved cooperatively—determined the difficulty level assigned to them in a final puzzle. The inaugural season of the PRO Chess League has concluded with the St. Louis Arch Bishops taking the championship title. St. Louis, led by the world’s number 2-ranked player Wesley So, faced in the final match the Norway Gnomes, led by number 1, World Chess Champion Magnus Carlsen. So also captured the medal for MVP. At the Cubing Classic in Melbourne, Australia, Feliks Zemdegs solved a 7×7 Rubik’s Cube in a world record 2 minutes, 18.13 seconds. A Michigan team by the name of Incredible Science Machine has broken the world record for number of dominoes (76,017) toppled from the center in a circle field. The circle was the final display in a longer domino-toppling series that started with a Rube Goldberg-type trigger and included separate sections dedicated to each of Earth’s continents. Japan’s youngest professional Shogi player, 14 year-old Sota Fujii, defeated the oldest high-ranked player, 76 year-old Hifumi Kato, in his debut match. When Fujii went professional in October, he had also broken a 63 year record held by Kato for being the youngest player to go pro. After further losses in a following tournament, Kato has fallen sufficiently in rank as to face mandatory retirement. Karolina Styczynska, 25 years-old of Poland, has become the first non-Japanese woman professional Shogi player. She earned her promotion to second-kyu (class) joryu at a recent tournament in Tokyo but her interest in Shogi was sparked back in Poland by reading the manga, Naruto. 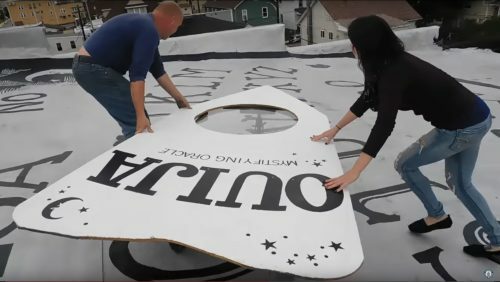 Guiness World Records has certified the world’s largest Ouija board, built on the roof of the haunted Grand Midway Hotel in Windber, Pennsylvania. The board measures 121.01 m² (1,302.54 ft²). The Google-sponsored AlphaGo computer program, which had previously defeated world Go champion Lee Sedol, racked up 59 wins playing anonymously online against a variety of masters. Sergey Karjakin, who had lost the recent World Chess Championship to Magnus Carlsen in tiebreak games, managed to best his rival on tiebreak criteria to claim the top position in the World Blitz Championship. At the same tournament, Vassily Ivanchuk won the World Rapid Championship, while Anna Muzychuk won both rapid and blitz titles in the women’s section. Wesley So won the London Chess Classic, putting him at the top of the four-stop Grand Chess Tour. His total prize winnings on the Tour: $295,000. 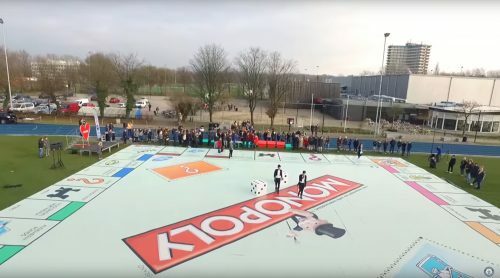 University students in Wageningen, Netherlands created the world’s largest Monopoly board, along with dice and houses all to-scale. Made with the support of Hasbro and certified by Guiness World Records, the board measured 900.228 m² (9,689.97 ft²). The previous record, set in the United States earlier this year, was 744.867 m² (8,017.69 ft²). It was two Dutchmen who faced off in the World Draughts Championship. Roel Boomstra came away the winner. In December, Feliks Zemdegs solved a 6×6 Rubik’s Cube in a world record 1 minute, 32.47 seconds. Then in January, he beat his own record with a 1 minute, 27.85 second solve. The 2016 World Chess Championship in New York ended with Magnus Carlsen of Norway still at the top, though as I watched the match proceed, I was starting to wonder if he had it in him. After seven draw games, the first win went to challenger Sergey Karjakin of Russia. But two games later, Magnus scored a win of his own, and at the end of the 12 regulation games, all was tied. The tie-break rapid games were where Magnus showed his strength. The first two settled on draws but the next two went to the champion. Still, an impressive performance as well by Sergey and a very interesting series of games. In the women’s Chess circuit, Ju Wenjun of China finished ahead of the Women’s Grand Prix, qualifying her to face Hou Yifan also of China in the 2017 Women’s World Championship. Chris Cadman of Scotland took home the Silver Perudo Cup trophy of the World Perudo Championship (Liar’s Dice) in London. The Top Chess Engine Championship was won by Stockfish. The score in the final 100 game match was Stockfish 54.5, Houdini 45.5. In third place was last year’s digital champion, Komodo. The standard 3×3 was solved by Mats Valk in 4.74 seconds at the Jawa Timur Open in Indonesia. His record didn’t last long, though. Feliks Zemdegs beat it by one one-hundredths of a second (4.73 seconds total) at the POPS Open in Australia. At Melbourne Cube Days, Feliks Zemdegs also solved a 5×5 in 41.27 seconds. At the Shanghai Winter, Kaijun Lin broke three blindfold world records, solving a 3×3 in 18.50 seconds; a 4×4 in 2 minutes, 2.49 seconds; and a 5×5 in 4 minutes, 46.74 seconds. Two of those didn’t last long either. Roman Strakhov did a 5×5 blindfolded in 4 minutes, 42.06 seconds at the Finnish Championship. And Kijun Lin bested himself in the 4×4 blindfolded, solving it in 1 minutes, 41.90 seconds at the Bid ‘n Blind in Guangzhou, China. The team from Greece won the World Magic: The Gathering Cup surpassing other top 8 finalist teams from Finland, Australia, Ukraine, Panama, Belarus, and Belgium. A group from France beat out a field of 64 teams to win the Hide-and-Seek World Championship. The event was held in the abandoned town of Consonno, Italy. In one game at the Chess Olympiad in Baku, Azerbaijan, Dana Reizniece-Ozola defeated the Women’s World Champion, Hou Yifan, despite being ranked 400 Elo points lower. Dana is no stranger to such lofty achievements, however. At 34 years of age, she is a longtime Chess competitor , holds graduate degrees in Translation & Terminology and Business Administration (in addition to further graduate studies in Law, International Business, and Aerospace Management), can speak six languages, and is also the Finance Minister of Latvia. Grandmaster Timur Gareyev broke the world record for consecutive games of blindfold Chess. In fact, most of the 64 games (54 wins, 8 losses, 2 draws) he played while pedaling an exercise bicycle. After declaring Monopoly an official sport, the Lagos State Sport Commission of Nigeria hosted a world record 1,300 people playing Monopoly at the same time in a single venue. That achievement was recorded at the state’s Under-17 Monopoly Championship, where also Elizabeth Braimoh of Top Field College took home the trophy and a NGN600,000 education grant prize (about $2,000). Eight winners secured second interviews at an annual Mahjong tournament meant as a job recruiting event for university students in Japan. At the Asian Rubik’s Cube Championship in Beijing, Kevin Hays of the United States solved a 6×6 Rubik’s Cube in a world record 1 minutes, 32.77 seconds. Not for speed, Tony Fisher demonstrated in a video solving the world’s smallest Rubik’s Cube (5.6 mm on a side). To get one so small, he had a 6 mm one 3D printed by Shapeways and then filed it down further. Among the activities that Cem Karabay of Turkey kept himself busy with during a world-record scuba dive of 142 hours, 42 minutes, and 42 seconds were underwater games of Backgammon. Allan Silva of Brazil has won his fourth consecutive Pan American Draughts Championship. The North American Scrabble Championship and a $10,000 prize was won by David Gibson, who in the final defeated his opponent 397-371 with words such as “drearies”, “serrano”, orcinols”, and “spelter” (none of which are recognized by my spell-checker).